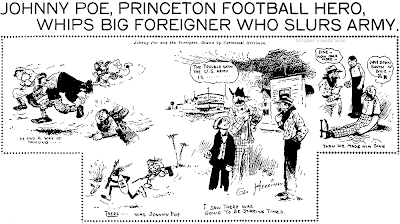 May 17, 1907 -- a cartoon about Johnny Poe, fabled Princeton football player and adventurer. Poe was most likely in Honduras at the time of this incident, trying to be a soldier of fortune and, once again, not finding any action. Good Wiki entry on Poe here. May 19, 1907 -- Herriman suggests an option to Mayor Schmitz of San Francisco. He's faced with corruption charges, and George helpfully suggests that he might just run off to Honduras to participate in their little war with Nicaragua instead of going to prison. Apologies for the rotten reproduction on these. We're coming into another period of less than optimal microfilm. 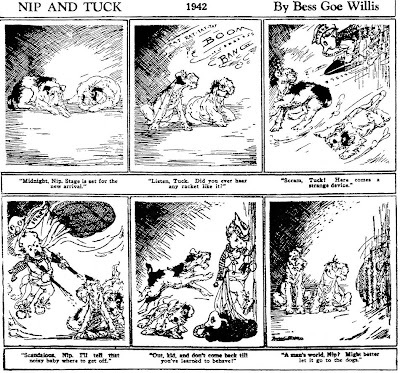 Here's a little dog strip called Nip and Tuck from the pages of the Boston Post. From the 20s to 40s the Post always ran a small selection of unsyndicated comics in with their Sunday comics section. This strip was one of the latter day entries. It started in 1934 and lasted until October 3 1943. For Bess Goe Willis, who was a prolific children's book illustrator, this was apparently a separate go-round with these two canine pals. The Ledger Syndicate advertised a daily panel by Willis of the same name from 1936-39. Unfortunately I've never been able to find such a panel in my research and so Ms. Willis has a spot on my mystery strip list. I could find no biographical info about Willis in a cursory web search, but I figure this strip must have been from the twilight of her career since her earlier work was far superior to the scratchy cribbed penwork exhibited here. The Chicago Daily News was the first newspaper in the country to adopt a daily comics page in 1900, but even before that they liked cartoons. 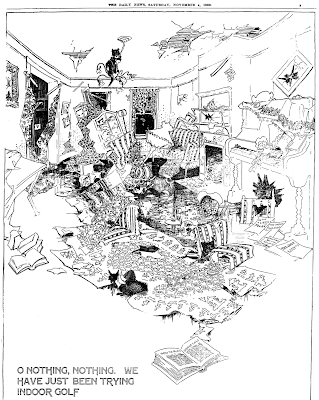 The Daily News didn't have a Sunday edition, so they made up for the lack of a color comics section starting on January 2 1897 by assigning Fred Richardson the task of drawing a full page cartoon for either their Saturday or Monday edition. And what cartoons they were! 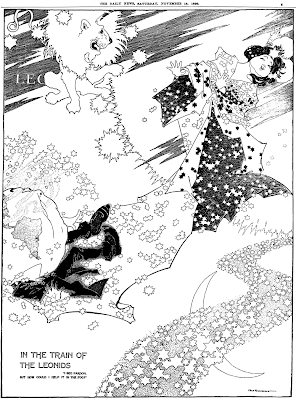 Fans of Richardson have compared him favorably with Winsor McCay for his incredible design work, and I won't argue with that assessment. The intricate and supremely graceful drawings must have impressed Chicago newspaper readers because a reprint book was issued in 1899, one of the earliest newspaper cartoon reprint books. A Book of Drawings by Fred Richardson now commands pretty heady prices when offered these days -- cheapest I've seen is $375. Anyone looking to buy me a Christmas present feel free to keep this book in mind! 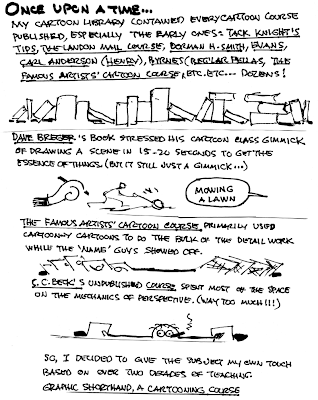 Richardson's cartoons were often full page panels, but he did plenty in the comic strip format as well. He loved drawing animals and many cartoons were populated by his impressionistic takes on various beasties. Ocassionally his cartoons were editorial in nature but even these were couched in terms of wild flights of fancy. 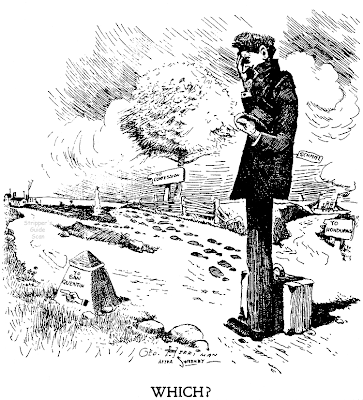 Richardson's work for the Daily News was too good to last, though, and his last page appeared on November 2 1901. He went on to a notable career in illustrating for books and magazines. He did make a return appearance at the Daily News much later on, but that will be a subject for another post. There's no doubt that had he stuck with newspaper funnies we'd today be discussing his work with the same hushed and reverential tones reserved for McCay. Much thanks to Cole Johnson for sending me the microfilm photocopies from which the above samples were scanned. Trust me, though, that these scans do no justice at all to Richardson, whose intricate designs are far too fine for the lo-res confines of your monitor. WOW! What beautiful, detailed artwork! Why haven't we (I) heard of him before? 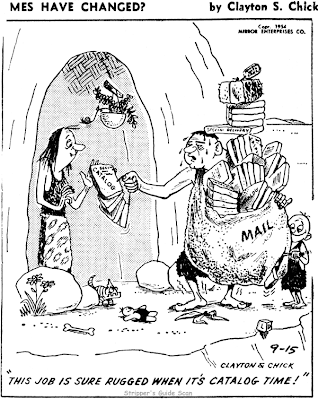 Obscurity of the Day: Times Have Changed? 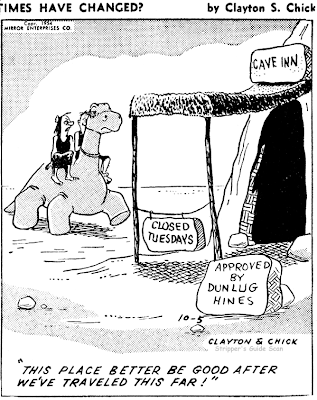 Here's an obscure panel cartoon called Times Have Changed?. You might be thinking to yourself, "What a transparent rip-off of The Flintstones and their 'modern stone-age family'!". Only problem with that assessment is that this feature predates The Flintstones by about seven years! 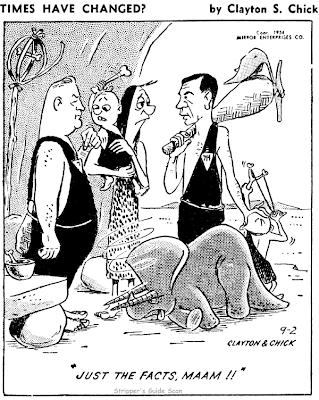 We all know that The Flintstones owed a lot of its inspiration to Jackie Gleason's classic The Honeymooners, but could Hanna and Barbera also have been fans of this panel? The similarities go well beyond the modernized prehistoric locale -- here we have costumes that match, domesticated dinosaurs used as appliances, rocks used in place of paper, even Hollywood celebrities recast as their antediluvian equivalents. And since this feature was distributed by the Los Angeles based Mirror Enterprises syndicate, it was presumably showing up in papers read in Hollywood. For such an intriguing feature, though, I'm afraid I don't have much information. It started on November 16 1953 and ran until sometime in 1955 -- my last samples are from February of that year. The creators were billed as "Clayton and Chick" (yes, the paper that printed my samples somehow misunderstood that and ran the credit as Clayton S. Chick). I don't have even a guess as to who these people are or what their respective duties were on the feature. Can anyone better ID these folks? 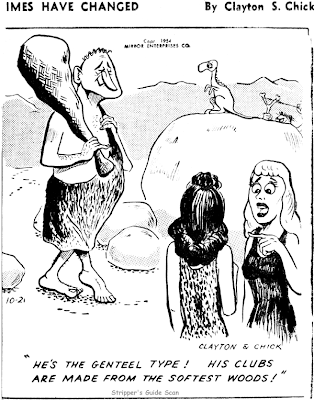 The inspiration for the updated cavemen motif may have come from a series of animated cartoons by Max Fleischer called the "Stone Age" series in Ca. 1940. 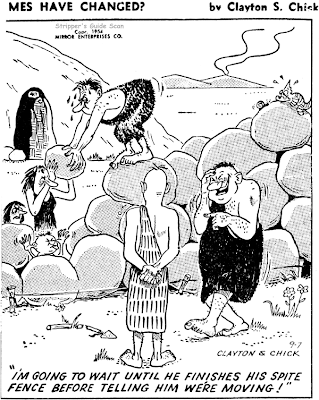 Modern cavemen aren't all that rare a breed in comics (see "Our Antediluvian Ancestors" elsewhere on this blog for instance) -- I just found this particular take on the subject to be almost ridiculously close to the concepts in The Flintstones. Hello, Allan---Could the "Chick" here be the same one who did those goofy little religious comics one often finds left in restrooms and public telephones?------Cole Johnson. Am I crazy or do I detect a resemblance? Jack Chick was my first guess too... and if that were the case, what a fascinating find! (I mean, it's interesting in its own right, but given the sort of strict scripturalism of Chick Publications, if this was indeed Jack Chick, I wonder if it was done before he was born again or something-- I mean, there's no cavemen or dinosaurs in Genesis. Thanks for unearthing these classic strips. They are even better than I imagined! P.S. Clayton was the writer and Jack Chick was the artist... although I suspect Chick also wrote some of them as well. His comic style is clearly represented in many of these examples. 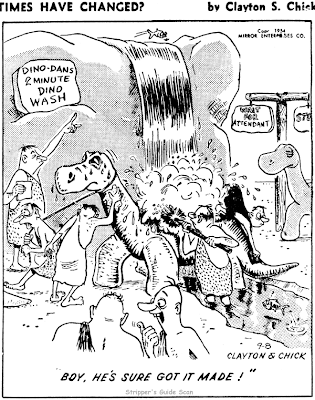 Jack Chick did tell me that he did a strip about dinosaurs! I'm sure this is the strip he told me about!!! One last Opper obscurity today from the files of Cole Johnson. Ship Ahoy ran from February 2 to May 17 1908. At this point in the story the gobs are trying to raise funds to go searching for a treasure. Unfortunately its been ages since I read these strips so I don't recall if the story ever finished playing itself out -- I suspect it did, which would make it a very early example of a closed-end strip. 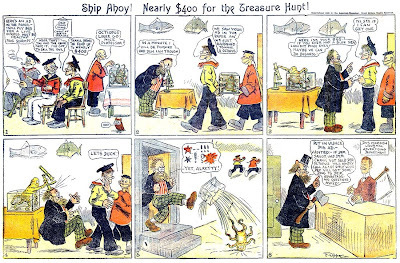 Cole contributes these notes: "Here's a short-lived 1908 strip about mischievous sailors. There's a Katzie episode where these sailors sell the kids a hell-raising parrot in the first panel, signed by Opper. Note the German Octopus-buyer goes to the office of the "Morgan Journal", the elusive Duetsches sprecht version of the N.Y.Journal." This reprinting of the first four years of Prince Valiant under the new helm of Gianni and Schultz is an eye-opening experience. Unlike many of you, I do get the Val Sunday page in my local paper, and I've been enjoying Gianni's art despite the criminally small quarter page presentation. What I failed to recognize reading the strip in weekly installments was the superb craftsmanship of Mark Schultz's script. Under the ridiculous strictures of a strip that tries to advance the storyline in a quarter page (even while sacrificing some of that space for a weekly synopsis) one doesn't expect all that much from a writer, and I confess that on Sunday mornings I failed to recognize the artfulness of the plot that Schultz was weaving. The reprint book gives me the chance to read the entire story at one sitting, though, and under these conditions it's plain that Schultz is a master at working under these severe restrictions. The story is a long one, a four year adventure in which Val and son Nathan set out from Camelot to find some respite from the boredom of court life. What starts as a simple desire to slay a dragon (!) turns into an epic adventure that eventually takes the pair as far afield as Africa. Against all odds, Schultz manages to keep this epic under control even when following up to three separate plotlines when the adventurers occasionally become separated. Schultz not only writes a corking good adventure, a real page turner that begs to be read in one marathon bout, but his work is meticulous. His story is peppered with foreshadowing devices that sometimes don't play out for months in newspaper time. Adventure comic strips have always worked under the convention that characters are introduced and last only until they've fulfilled their role in the plot -- plot threads likewise can conveniently disappear without a trace. Schultz, though, surprised me over and over by having long-forgotten characters and hanging plot threads reappear and weave themselves back into the story, a plotting device that we might expect in a novel but is a marvelous and unexpected surprise in a comic strip. After the sumptuous production of The Prince Valiant Page I was all set to hate this reprinting. The large format reproduction in that book is not used here. But given that Gianni is creating artwork that can withstand tiny reproduction, the mini-tabloid format in this Andrews McMeel production is perfectly suitable to the project. 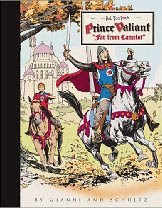 Of course I found myself wishing that Gianni had the elbow-room to produce a more detailed vision of Prince Valiant, but for that we must fault the syndicate and the newspapers that insist on offering the strip in microscopic formats, not the book publisher.